Are you ready to expand your machine embroidery skills? Join us to master the mystery of machine embroidery. The OESD School of Embroidery monthly club meets every month on the 1st Monday at 1:00 PM and the 3rd Monday at 6:00 PM. The Creative Studio lessons are made up of 2 - 15 minute videos each month that will focus on a quick and easy sewing project and a technique lesson that will vary each month. You do not have to own a Bernina to take this class. We are ready to start our 2018-2019 BOM. This pattern is called Northern Lights with 12 - 15" sampler blocks and 20 - 6 1/2" sampler setting blocks. This year's BOM quiet will use batik fabrics in saturated colors with one background fabric that you will choose and purchase. 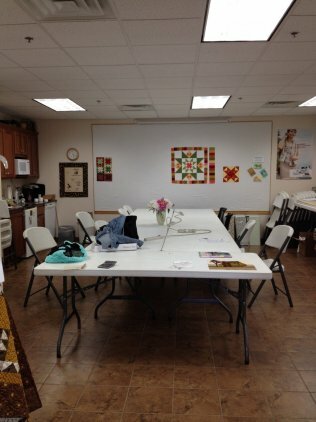 Quilter's Haven in Rosemount, Minnesota offers quilting classes for all skill levels. Learn to quilt, improve your quilting techniques or learn new quilting techniques. Class sign-up: To register for classes, call the shop at 651-322-7071 or stop by Quilter's Haven. Class supply lists are available at the shop. To assure a spot is reserved for you, all classes require payment at time of registration. Class Refund Policy: Four day advance notice is required for a class refund. Refunds will be given via store credit or may be applied to another class. All refunds must be taken within 60 days of class cancellation or be forfeited. Our classroom is spacious. Come and join us. Click on the Class Title for more information about the class!! Quilter's Haven is located in Rosemount, Minnesota, about 1/2 mile north of County Road 42 (150th St.) on Highway 3 (South Robert Trail). County Road 42 (150th St.) traveling west is accessible from 52 and 55, and Hwy 35W or 77 (Cedar Ave) to the East.